The classic gleaming all-white kitchen heaven is still beautiful to look at. Sure. But we’ve seen them in every conceivable variation a hundred times before. What a real luxurious kitchen needs -apart from great food- is that little something that makes the room stylish yet comfortable. A place to relax and enjoy. A place of great elegance and scrumptious meals, just as much as for comfortable breakfasts and lively late-night gatherings. 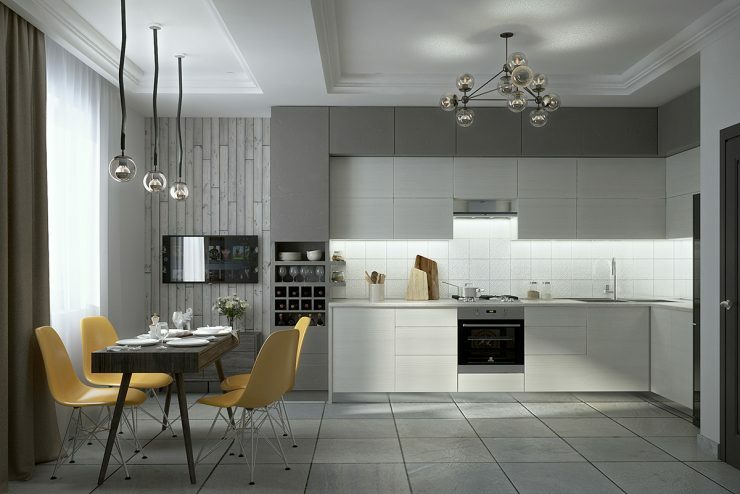 Here we have the latest design ideas for your luxurious kitchen adventure. Wall-to-floor tiling and a few shades of grey beautifully offset the classic white base. Add in some well-chosen splashes of lively colour and a dash of modern lighting, and you’ll find your kitchen transformed into an oasis of clean calm. Black is beautiful! 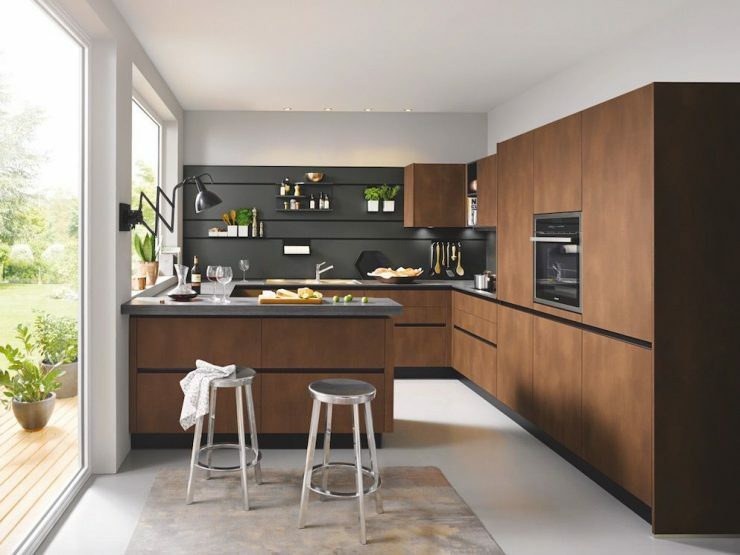 Whether as carefully added accents or as the main colour, black is definitely one of the biggest trends when it comes to luxury kitchen designs. For those reluctant to sip their morning coffee in an all-black environment, monochrome might just be the way to go. 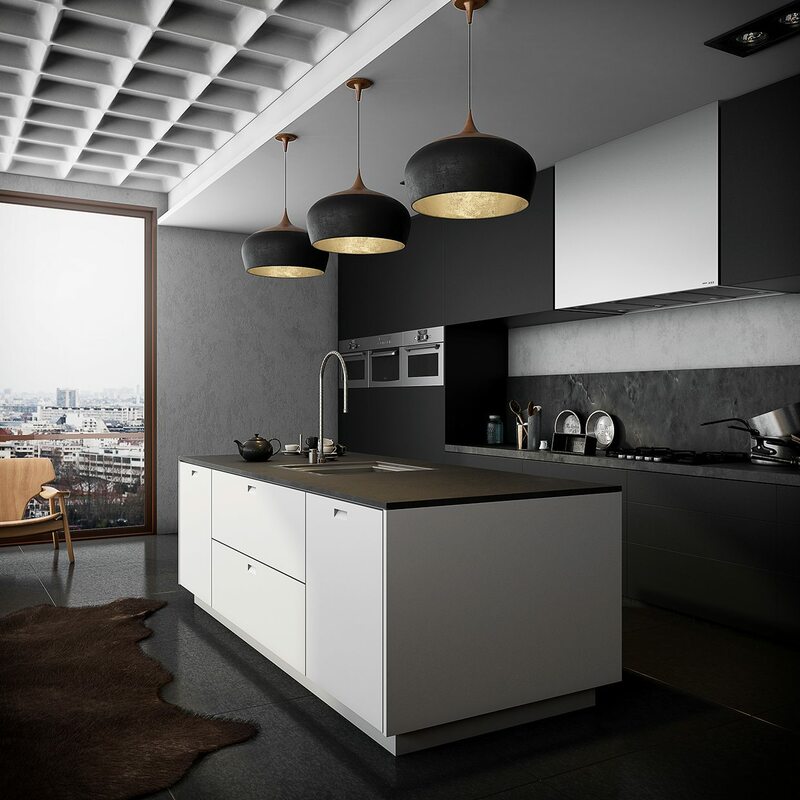 The matte black paneling only enhances the brightness of the grey and white accents, giving the kitchen an airy feel despite its dark base. Sometimes a bold splash of colour is all that’s needed to transform an ordinary kitchen into something extraordinary. Try playing with bold colours like yellow, red, or green to give your kitchen that little extra. But don’t go all out! A dash of colour on your kitchen island base, a few colourful open shelves, or just seating in vibrant colours are the little touches your luxury kitchen needs. The design-nightmare of our childhood is back. But just like us, it has grown up beautifully, too. 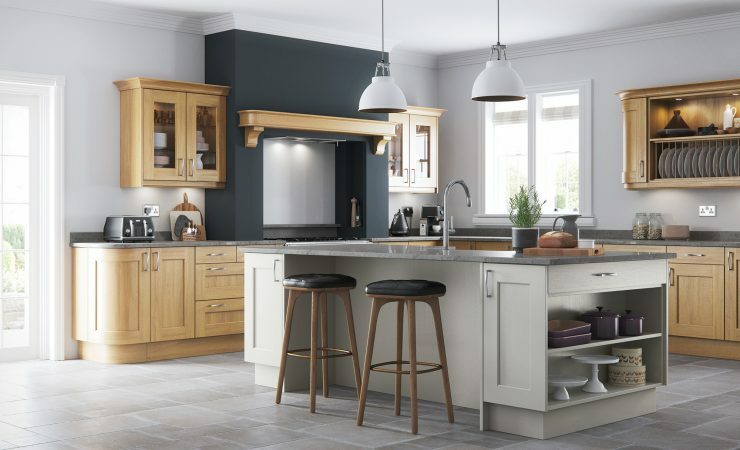 Sparse oak accents in cupboards and paneling give any kitchen an instant boost when it comes to homeliness and warmth. Combined with whites and greys the wood-finishes create a unique atmosphere that invite you to stay and enjoy the relaxing atmosphere. And a good glass of wine or two. Open shelving gives your kitchen that lovely industrial touch that makes a kitchen feel lived in and well-used. Whether you decide to just add a few shelves and hangers for herbs, pots, and dinner ware, or you want to go all out and forego closed storage space completely, open shelving allows you to give your kitchen your very own personal touch. Display special ingredients, small accessories, or your favourite beverages and make your kitchen truly yours.